Rolf is a wolf. A GOOD little wolf. His best friend is the elderly Mrs Boggins, he likes baking cakes, eats all his vegetables and is always kind to his friends. He hopes that he will never meet a real live big BAD wolf…. This book is a visual triumph and another example of how words and pictures interact to create the whole text. It begins with a disembodied voice asking if everyone is sitting quietly. The group consists of Little Red Riding Hood, a woodcutter, three little pigs, and Rolf. For adults who know the texts, a faint whiff of suspicion is evoked at this point, and never really goes away. The big bad wolf, as seen above, is big, dark, and deliciously scary. He inspects Rolf to ascertain if he really is a wolf (including a comic sniff of his bottom) and then gives him the task of proving himself. Rolf is not especially good at howling, or blowing down his best friend’s house, but the big bad wolf has one final suggestion… and it involves a knife and fork. The brilliance of this book lies in what is left unsaid. The knife and fork is the only clue to the wolf’s intentions and the reader’s need to decode the story continues until the very last page and an ending that is not only genuinely surprising but, in this day and age, very, very brave. And funny. Wickedly so. 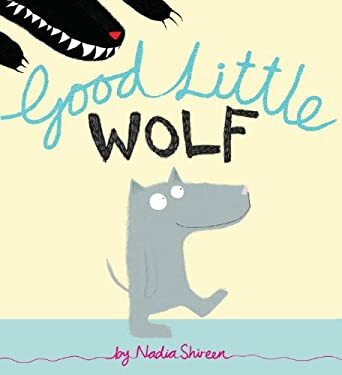 Good Little Wolf was shortlisted for the 2012 Waterstones Children’s Book Prize and is Nadia Shireen’s first book; a highly accomplished debut. It would be best avoided for the under-3s: the humour is subtle, there is a lot of deduction required from the pictures, and the ending may not suit the sensitive, but with older preschoolers and schoolchildren it will no doubt prove very popular. Visually arresting, morally intriguing and with a sting in the tail, this is well worth a read. Julia Donaldson has borrowed from Alfred Noyes’ poem The Highwayman for this tale of a rodent robber and his endless quest for junk food. The galloping cadences echo the horse’s hooves and, as in the original, make this easy to read aloud and give it an urgent, pacey feel. The Highway Rat robs travellers on the road – not for money, but for food. He seeks out cakes, biscuits, puddings, lollies, and chocolates, although the animals he holds up are only able to provide him with a bunch of clover, a bag of nuts and a leaf. Undismayed he continues his pillaging and “the creatures who travelled the highway / Grew thinner and thinner and thinner / While the Highway Rat grew horribly fat / From eating up everyone’s dinner”. Fortunately a ‘plucky young duck’ has a cunning plan to end the Highway Rat’s reign of terror. There are a few briliant moments in this story. The Highway Rat’s demands come across well through the verses and are fluently and cleverly expressed. Stereotypical phrases such as ‘stand and deliver’ and ‘who goes there?’ are also worked in nicely. Ultimately however The Highway Rat feels weak, especially in comparison to Donaldson’s other books. Axel Scheffler’s drawings are as accomplished as ever and the rhymes work fairly well, but the ending of the book is awkward and unconvincing – it does not evolve naturally from the rest of the story. A morality tale of a dessert-hungry rat getting his just desserts, The Highway Rat deserves a reading, but not, perhaps, a space on the bookshelf. Huge thanks to all at Booktrust – this was a freebie we won through a Valentine’s Day competition on Twitter. It’s a brand new, hot off the presses, 2012 picture book, and very stylish it is too. Monster is a googly-eyed hairy creature living in a world of cute fluffy things. Surrounded by bunnies, kittens and puppies he naturally feels a little bit of an outsider. In a practical and proactive manner he decides to go out and look for love. Linguistically this book has an unusual chatty style which is appealing. Monster is “I-suppose-a-bit-googly-eyed” and “lives in a world of cute, fluffy things, which makes being funny-looking pretty darn hard.” All this makes it very easy and charming to read, and no doubt highly entertaining for little ones who will enjoy the sense that the book is ‘speaking’ to them. There is a lot of detail in the bold and quirky illustrations, too, including some excellent jokes in the writing on lists and books that will keep adults interested and give emerging readers something to come back to. Poor Monster is a sympathetic character who will charm anyone and perhaps the only issue with the premise of the book is that he is incredibly cute just as he is! It is a difficult book to place in terms of age because it does turn quite sinister in the middle. When Monster is unable to find love “it began to get dark. And scary. And well, not very nice.” The page is entirely black apart from Monster’s huge, unhappy eyes and some miserable-looking teeth. This is probably as close as a picture book gets to representing depression. Clearly (and sadly) a reality for some young children and also for some of the adults they live with, this is an issue that perhaps demands to be dealt with. It is done simply and metaphorically (Monster has his own little raincloud in the manner of vintage cartoons) and certainly opens up an opportunity for talk about sad feelings and how sometimes things can seem bad when in fact happiness is just around the corner. On the other hand it makes Love Monster, for a few pages at least, very serious indeed in a way that some parents may find unsettling and some children unnerving. Parents should use their own discretion as to whether their children can cope with it. Overall this is an engaging and meaningful story with a traditional happy ending and bold, expressive drawings. It certainly establishes Rachel Bright (this is her fourth book) as someone to watch out for. One to share and discuss with pre-schoolers and older. Daisy’s parents never listen to her. So when she insists there is a large purple rhinocerous in the house nobody registers him. Daisy sees him in the hall, glimpses him in the garden and even <giggle> surprises him on the loo! Not until the pancakes run out (because as it turns out, large purple rhinos do eat pancakes) do her parents suspect anything is wrong, and even then they don’t believe that Daisy’s now-friend the rhino is responsible. “What next!” they hoot, “A shark on the toilet! A polar bear in the fridge! ?” With typically parental myopia, Daisy’s Mum and Dad even suggest that they visit the zoo to see a real rhino… Daisy is unimpressed, given that there’s a perfectly good rhino sitting on the sofa. However, when they see a Missing poster for a large purple rhino all three of them hurry home at once! This is an extremely well-written picture book, which makes a lot of sense when you discover that Anna Kemp works at Oxford University writing on contemporary French literature. It has all the hallmarks of someone who really knows how to write: carefully paced, fluently phrased, and with a light touch of humour. Sara Ogilvie’s illustrations have bags of scribbly character and the largest purplest rhinocerous in the world is drawn to full justice, especially when his large purple bottom is being squeezed into the car. Sadly the story of distant preoccupied parents probably rings true for a lot of children these days, but Daisy at least gets hers back on side by the end of the book. Hopefully the story will serve as a timely reminder to the distracted and busy that sometimes children have something important that needs to be heard – and that they don’t always know best! As always, books in which the child has power will appeal to all ages but especially to preschoolers and those at primary level. A fabulous and entertaining book. This 2011 story should really have been kept back for a while to avoid an undue bias towards Oliver Jeffers but frankly it is too good to leave out. In the end, the catalogue of things that disappear up this (truly astonishing and gravity defying) tree goes from the sublime to the ridiculous, including as it does the milkman, the family car, a long-distance lorry, a whale, the house across the street and (of course!) the kitchen sink. The increasing size and the impossibility of the things that Floyd throws up there will delight readers of a range of ages, but there are several jokes for adults in here too. Fairly early on, Floyd fetches a ladder “to sort this out once and for all” – then throws it up the tree. The same fate awaits the saw that he carefully lines up, and the team of firemen (plus their engine) who offer to help. Utterly bizarre but engagingly surreal this is a simple idea stretched to the point of madness, but it is great fun to read. Even odd little touches such as Floyd having a favourite shoe (as opposed to a favourite pair?!) add to its charm. The illustrations are artistic and flamboyant – a step further than the stylish but reserved quality of Lost and Found – and the text varies in size and looks as though it were scribbled with a 4B pencil. Although this would be a struggle for a young child (especially one with dyslexia or similar) to read independently because of the handwritten style, it is a great book for sharing.